Last week I purchased my very first pieces of Topshop make up. Well I might be lying... I think they used to have a cosmetics line back in the 90s which I owned some of, and loved. 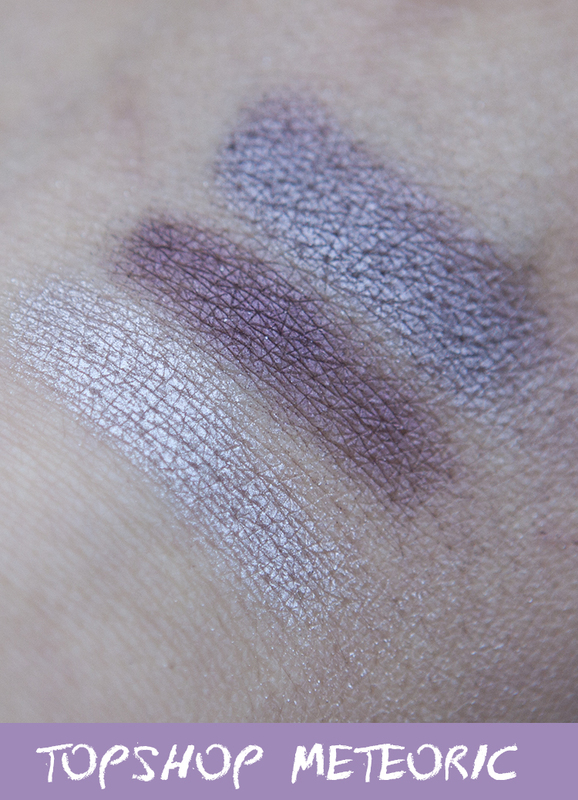 Anyway, I digress... one of the pieces I bought was the Meteoric eyeshadow duo. It looked to me very much like a special kind of MAC shadow, in it's shiny packaging and colours swirled into each other. At £8 for 2.5g it seemed quite good value, for essentially 3 colours - the silvery shade, purpley shade, and mixed together. I swatched them on my hand, silver, purple and then mixed together. Even the silver on its own has quite a few lilac tones in it, and together they made a gorgeous metallic purpley fawn colour. This photo was taken in the shade outside. One thing I was disappointed with, is that the shadow is quite powdery. There was quite a lot of fall-out when I applied it to my eyes, and after using it, you can see just how much excess powder there was on the shadow itself. I see it will be quite a messy product to use! 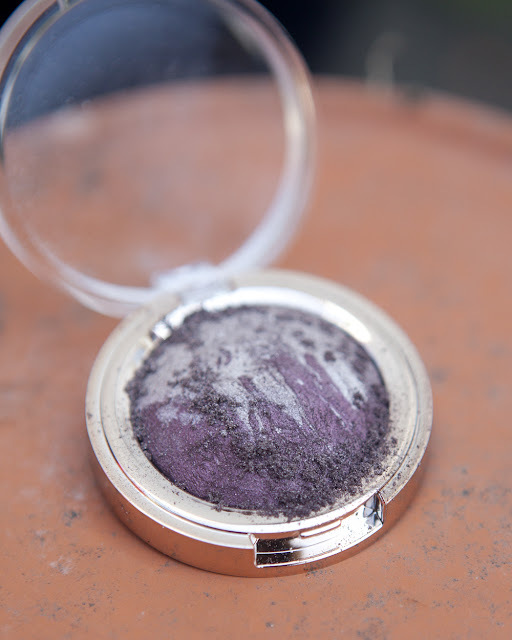 I applied it to my eyes using the silver all over, the two colours mixed together in the outer third of my lid, and the purple in the crease. 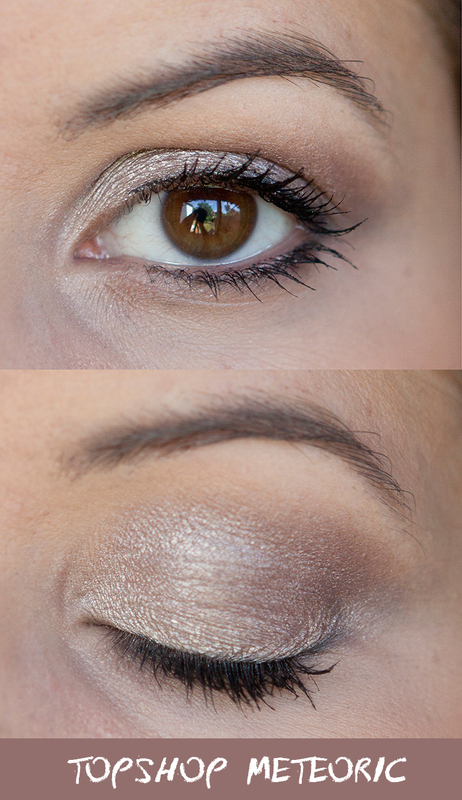 I then used MAC Smoulder eyeliner on the top and bottom lash line and finished with Revlon CustomEyes mascara. I took this photo indoors. I noticed that it looks slightly more brown in these photos, I think it depends on the kind of light you are in. There is definitely more of a cooler tone to them... I am used to wearing warm toned eyeshadow so think I will use it most often as the two colours mixed together.... very very carefully trying not to spill any of that excess powder! What do you think? 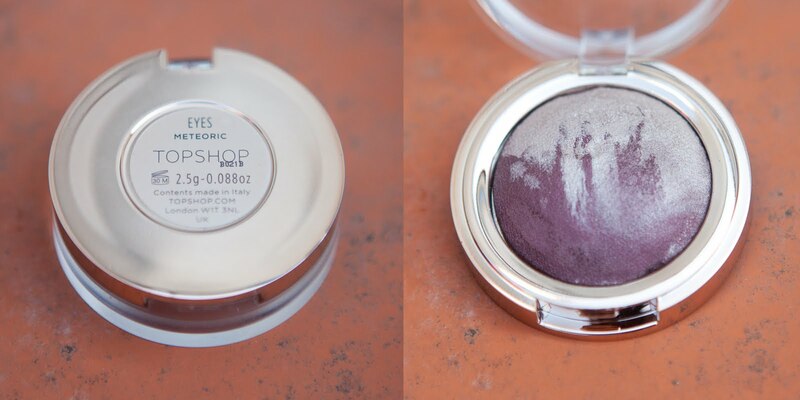 Do you own any pieces of Topshop make up, or Meteoric eyeshadow? always been a bit wary of clothes shops doing makeup, can be a bit crap and tacky, so i've not tried it myself. I dont think they even do the makeup brand in topshop in malta, and i rarely go in there as their prices in euro are extortionate. This looks gorgeous but I'm surprised how different the colours look on you - like you say it's maybe just the pics. It's really pretty the way you've applied it (as always! ).